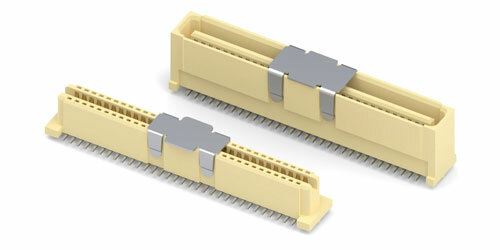 Mill-Max introduces 64 position, 1 mm pitch mezzanine connectors for parallel board stacking interconnections. The connectors meet EIA-700 AAAB specifications for IEEE 1386 applications. IEEE 1386 is the industry standard for adding general functionality to motherboards and these mezzanine connectors are the perfect solution for connecting the common mezzanine card (CMC.) Some of the environments where this standard can be found are on VME, VME64 & VME64X boards, CompactPCI boards, Multibus I & II boards, desktop & portable computers and servers. They can also be used as modular connectors for front panel and backplane I/O cards. The 891-10-064-30-120000 male and 893-43-064-30-420000 female are surface mount connectors that have a mated height of 10 mm. The 1 mm pitch provides high density packaging crucial for saving board real estate. Locating posts are incorporated into the housing to promote accurate placement on the P.C.B. Both the 891 & 893 connectors feature 30µ" gold plated contacts, providing optimum conductivity and effective wear resistance, and tin plated solder terminals for ease of soldering. The insulator housings are made of high temperature glass filled LCP, rated UL 94 V-0.